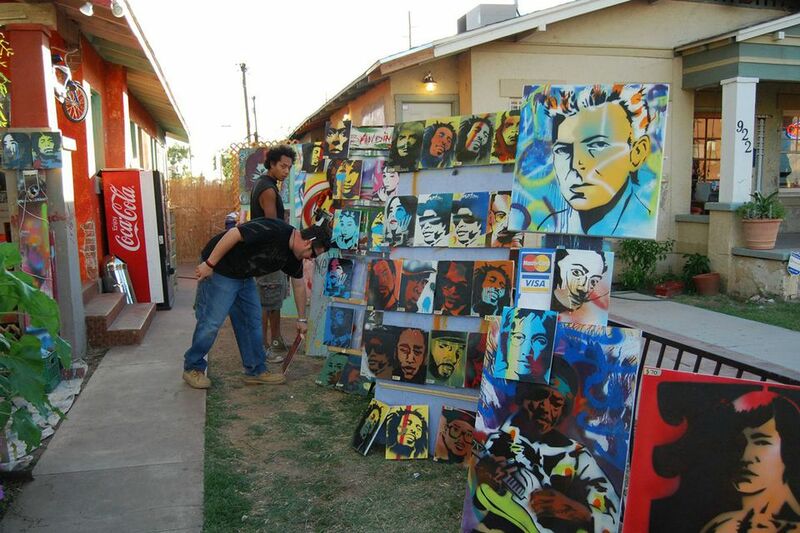 When it comes to local art events, Phoenix is bustling with activity year-round, but the famous First Friday Art Walk sponsored by Artlink Phoenix is one of the biggest such events in the country. As the name suggests, the event takes place on the first Friday of every month from 6 to 10 p.m. First Friday features self-guided tours of downtown Phoenix art galleries, studios, and creative spaces and is "dedicated to bringing together artists, the public, and businesses for a greater understanding, appreciation, and promotion of the arts and the development of a strong and vital downtown Phoenix arts community." Free shuttles departing from the Arizona Center provide service along three different routes through the art districts of Phoenix, but you can hop on at any stop along the way including the Phoenix Art Museum, CityScape, Unexpected Gallery, and Oasis on Grand. Phoenix First Friday Art Walk typically features between 70 and 100 participants situated from Indian School Road to Buchanan Street and from 12th Street to 17th Avenue. If you aren't already familiar with First Friday's routes, just stop at Phoenix Art Museum first and pick up a current map. There's usually an ArtLink volunteer on hand who can answer your questions before you head out to enjoy your Friday evening in Phoenix. Along with dozens of artist spaces to explore, you'll also find music, lectures, demonstrations, and fun activities for all ages—there's no way to see it all in one night! The downtown Phoenix First Friday event is not about glitz or champagne or cocktail parties - it is about the inner-city urban experience, so there's no need to dress to impress. Artists living and working downtown exhibit downtown, and thousands of people enjoy what is offered during each First Friday event. several exhibitions sell half of their offerings during these openings. First Friday might seem complicated if you've never done it, but it's relatively simple once you get to know where everything is on the map—and understand how to use the free shuttle and trolley system to get around. The important thing to know is that it takes place every month from 6 to 10 p.m., but the last circuit on the trolley tour departs at 9:30. First Friday has grown dramatically over the years, which has been great for the downtown Phoenix arts community as well as local businesses. As a result, navigating this popular monthly event can be a bit challenging. Keep this tips in mind on your visit to the art districts of the Valley of the Sun and you're sure to have a great time at First Friday Art Walk. There's no possible way to see everything on one trip—four hours just isn't enough time to travel the full route and see all 70 (or more) artist space. However, you can always come back another month to see some you missed. The First Friday attendees are predominantly young people, but all ages can be seen browsing the various galleries. Although it started as an art event, various museums and venues featuring live music and drink specials open for First Friday as well. The shuttle options have varied over the years, and sometimes from month-to-month. Since February 2017, there have been three shuttle routes: Grand Avenue, Roosevelt Row/Central, and Warehouse/Downtown, all of which intersect at the Connector Hub at Arizona Center (400 East Van Buren Street). You can park at the Arizona Center and get your parking validated for the first two hours for First Friday trolley rides. If you don't want to drive, you can use Valley Metro Rail. There are five trolley hubs with park 'n' rides: Phoenix Art Museum (1625 North Central); Oasis on Grand (15th Avenue and Grand Avenue); CityScape (First Street and Washington Street); Arizona Center (400 East Van Buren Street), and Unexpected Gallery (734 West Polk Street at Grand Avenue). Trolley hubs and routes are subject to change. You can park for free at the Phoenix Art Museum, subject to availability. Keep in mind that parking meters in Phoenix are not free until after 10 p.m. on Fridays. The shuttles constantly circle throughout the evening, stopping at the hubs in approximately 25-minute intervals. The shuttles start at 6 p.m. and are clean and comfortable, and the last circuit is at 9:30 p.m. Crowds are usually sparser early in the evening, and some galleries might be a bit slow to open, but activity picks up between 7 and 8 p.m.
You can get a full First Friday map at the Phoenix Art Museum or on the shuttle buses, but those tend to run out later in the evening. There are many cafes and other food stops along the way, some of which may offer drink and food specials in celebration of the event. If you are on a schedule, or just don't want to take a shuttle, there are places to park along the street nearly everywhere on the First Friday routes, but some may have meters. Shuttle dependability and availability varies from year to year, so you may want to choose to get off at an area with the most galleries and limit the number of times you rely on the shuttle services. First Friday is an opportunity for people with political beliefs, condos to sell, petitions to sign, or other information to share to be out and about. If you aren't interested, just be polite and say "no thanks." Many of the works of art you'll see in the numerous galleries, studios, and artist spaces will be for sale. Inquire with the studio or space manager or staff member on duty during the event if you might want to purchase a piece of art as a souvenir. During the latter part of the 1980s, there was tremendous interest in downtown arts and entertainment which propelled, among other initiatives, the 1988 Bond election, which made possible the new central library, the Arizona Science Center, and the Phoenix Museum of History. This new infusion of energy led to the Jackson Street Studios, an arrangement to accommodate artists displaced by the Talking Stick Resort Arena. Artlink was founded with this energy, and some of the art spaces created during that time, such as Alwun House, live on today. The annual Art Detour, originally designed as simply an open-studios tour, was founded in the spring of 1988 and has attracted hundreds of artists and thousands of art lovers to the downtown area every year. The galleries and alternative art spaces open year-round were joined by music venues, cafes, and individual artist studios and, during the 1990s, Artlink decided to organize this into the First Friday event. In 1998, there were only 13 spaces open on the first Friday evening of each month, but the event has since expanded to include as many as 100 galleries, studios, and artist spaces during the busiest times of the year. There are now even attractions and venues that open their doors with free admission as part of First Friday Art Walk. Discover Phoenix's Museums — for Free!